This page tells you information about us and the legal Terms and Conditions (Terms) on which we sell any of the Products (products) and Services (services) listed on our website (our site) to you (the customer). These Terms will apply to any Contract between us for the sale of Products to you (Contract). Please read these Terms carefully and make sure that you understand them, before placing an order with us. If you do not understand or accept any of the Terms, please contact one of our Sales Team to discuss BEFORE placing an order with us by e-mailing us at [email protected] or contact our Customer Services team by telephone on 0207 043 2598. On placing an order for any of our Products, you agree to the acceptance and binding of these Terms and Conditions (see Clause 5 on Our Contract With You). If you refuse to accept these Terms, you will not be able to order any Products from our site. You should print off a copy of these Terms and Conditions for future reference. Your Contract is with Time 4 Diamonds DMCC LTD. All Contracts are between you and the Company as a separate legal entity. The Directors of the Company have no liability for any acts or omission on the part of the Company and cannot be held personally accountable for the Companies actions. These Terms, and any Contract between us, are only in the English language. Time 4 Diamonds is the registered trademark and trading name for Time 4 Diamonds ( T 4 D ) DMCC, registered address: Unit No: AG-PF-167, AG Tower, Plot No: JLT-PH1-I1A, Jumeriah Lakes Towers, PO BOX 502122. Time 4 Diamonds DMCC LTD, registered address: 1st Floor, 3 More London Riverside, London, SE1 2RE (company number 09702973), is acting as exclusive EU sales and marketing agent, on behalf of Time 4 Diamonds ( T 4 D ) DMCC. All goods and services provided to customers in the EU are supplied by European suppliers on behalf of Time 4 Diamonds ( T 4 D ) DMCC. We are Time 4 Diamonds DMCC LTD, a company registered in England and Wales under company number 09702973 and with our registered office at 1st Floor, 3 More London Riverside, London SE1 2RE, acting on behalf of Time 4 Diamonds ( T 4 D ) DMCC, registered address: Unit No: AG-PF-167, AG Tower, Plot No: JLT-PH1-I1A, Jumeriah Lakes Towers, PO BOX 502112. Our main trading address is Time 4 Diamonds DMCC Ltd, 3 More London Riverside, London, SE1 2RE. Please note that any transactions conducted at our showroom are by appointment only. If you wish to make an appointment, please contact us on 0207 043 2598. 2.1 To cancel a Contract in accordance with your legal right to do so as set out in Clause 13, you just need to let us know that you have decided to cancel. You can e-mail us at [email protected] or contact our Customer Services team by telephone on 0207 043 2598. 2.2 If you are emailing us or writing to us please include details of your order to help us to identify it. If you send us your cancellation notice by e-mail , then your cancellation is effective from the date you send us the e-mail. 3. Contacting Us If You Are A Business. 3.2 These Terms and any document expressly referred to in them constitutes the entire agreement between you and us and supersedes and extinguishes all previous agreements, promises, assurances, warranties, representations and understandings between us, whether written or oral, relating to its subject matter. 3.3 You acknowledge that in entering into this Contract you do not rely on any statement, representation, assurance or warranty (whether made innocently or negligently) that is not set out in these Terms or any document expressly referred to in. 3.4 You and us agree that neither of us shall have any claim for innocent or negligent misrepresentation or negligent misstatement based on any statement in this Contract. - Un-worn- These watches have been purchased by the original purchaser, and subsequently sold to us as unwanted items that have never been worn. - Ex-display- These watches may have been used as display, exhibition or show items before they came to us, therefore may or may not have relevant manufacturer applied seals and stickers in place. - Preowned- These watches have been previously purchased new and have been used by the purchaser, before being subsequently purchased by us. - Bespoke/ Custom- Any watch or watch part that has been modified or altered in any way by us, for example diamond setting and personalisation. 4.1 The images of the Products on our site are for illustrative purposes only. Although we have made every effort to display the colours accurately, we cannot guarantee that your computer's display of the colours accurately reflect the colour of the Products. Your Products may vary slightly from those images. Further, as Products sold are unworn or pre-owned (as described above), we cannot guarantee that they will match our pictures exactly. 4.2 All sizes, weights, capacities, dimensions and measurements have been taken directly from the manufactures' specification; however these may vary slightly due to the pre-owned nature of the Products. 4.3 The packaging of the Products may vary from that shown on the images on our site. 4.4 Although we warrant that the Products will, at the time of delivery, correspond to the description given by us, all Products we sell are of a technical nature and it is not practical to publish detailed specifications of all the Products. All images, descriptive matter, specifications and advertising are for the sole purpose of giving an approximate description of the Products. Full technical details are available from the original manufacturer's brochures and websites, these can change however if the watch has been modified/customised from original specification. 4.5 Payment of goods, either partial or in full, verifies that you, the customer, is satisfied to the best of your knowledge with the quality of the Products and the suitability of the Products for your particular purpose. 4.6 Products are not sold on a trial basis. 4.7 Whilst we endeavour to ensure all images and specifications are correct at the time of publication, they do vary. As such we can accept no responsibility for incorrect images/information. If however you spot a mistake with an image or with product specification, please let us know. 4.8 Certain Products may not be sold with original warranties or box, and may come with small signs of display use. 4.9 The date of manufacture of a watch may differ from the date displayed on the original manufacturer’s warranty card. The date of our Time4Diamonds warranty may also differ from the date of manufacture. Please contact us for more information. 5.1 We are not authorised dealers for any of the manufacturers we feature on the site. We sell and have access to unworn, pre-owned or ex-display watches as described in Clause 4.1. We can also source un-worn watches, however these are not held in stock and will be sourced from our supplier. You will find a list of the Products that we currently have access to under the “In Stock” tab on our website. 5.2 Our online shopping pages will guide you through the steps you need to take to place an order with us. Our order process allows you to check and amend any errors before submitting your order to us. Please take the time to read and check your order at each page of the order process. 5.3 You must make full or partial payment of the Products at the same time that you place the order (as agreed between us). The Contract between us will only be formed with full or partial payment of the Products (once funds have cleared in the bank). This will be considered the start date for us to process your order, and for any services in the case of non-stock watches. This also applies to all bespoke and custom orders; any delays in payment will result in possible delays in delivering the customer order. 5.4 In all cases we must receive full and cleared funds prior to despatch of the Products (see Clause 7 for accepted ‘Payment Methods’). 5.5 For all Products ordered, outstanding balance payments must be received within 14 days of your item being ready for dispatch. Failure to do so will result in you losing any deposit and your order being cancelled. 5.6 Orders can be accepted when being paid for by any major credit or debit card; there will be an additional transaction charge for payments made using credit cards (see Clause 7) and this will be listed at the time of payment. 5.7 Your order will only be processed once authorisation of your credit card has been properly received. For security reasons we will require for any transaction over 5000 GBP to be supported by one form of identification and one form of proof of address, clearly showing your full name and address, via fax or scanned email. Failure to provide these documents will result in your order being delayed and possibly cancelled. 5.8 Once your order has been completed we will inform of the despatch details via a despatch email. 5.9 If we are unable to fulfil a customer request, for example because that particular product is not in stock or no longer available, or due to an error in the price on our site as referred to in Clause 6.2, we will inform you of this by e-mail as soon as we are aware, and will not process your order unless you direct us otherwise. If we have already received full or part payment for the Products we will refund you the full amount including any delivery costs charged as soon as possible. 6.1 The prices of the Products will be as quoted on our site at the time you submit your order. We take all reasonable care to ensure that the prices of Products are correct at the time when the relevant information was entered onto the system. 6.3 Our site contains a large number of Products. It is always possible that, despite our best efforts, some of the Products on our site may be incorrectly priced. In the event that a product is listed at an incorrect price due to a typographical error or error in pricing information from our suppliers, we shall have the right to refuse or cancel any orders based on the incorrect price whether or not the order has been confirmed. If the correct price of the Products is in fact lower than the price detailed on the website or in your order, we will charge the lower amount and proceed with the order. If the correct price of the Products is higher than that advertised on the website or in your order, we will contact you as soon as possible on discovering the error and give you the option of either continuing with the order at the correct higher price, or cancelling the order. If we are not able to contact you regarding the error either by email or phone within 5 days, we will consider the order cancelled until we speak to you. We will notify you by email of the cancellation, and return any funds already paid to you within 14 days of the date we cancel the order. 6.4 The price of the Products excludes delivery charges. 6.5 Please note, we work under a VAT margin scheme, therefore you cannot claim VAT back from a purchase. - Cash. – cash payments over £5000 will need to be supported by one form of identification and proof of address, plus a verifiable explanation of where funds came from. - Bank transfer - Please contact us for our bank account details. 7.2 Payment for the Products and all applicable delivery charges must be made in advance of the Products being despatched. 8.1 Delivery dates will vary depending on the availability of the Products, whether they are customised pieces, and the customer location. We will contact you with an estimated delivery date once your order has been accepted. You can also contact us prior to placing the order to discuss an estimated delivery date on the Products you are interested in. All dates quoted for despatch and delivery of Products are estimates only. In exceptional circumstances, or in some cases of non-stock watches, delivery may take up to 4 months. In the event that it takes us more than 90 days to complete your order, and to deliver your product, we will contact you via email or phone to let you know. 8.2 If we miss the estimated delivery date or deadline for any Products or services sold/ordered we will not refund any payments made unless we are unable to deliver the items ordered within 120 days. 8.3 Occasionally our delivery to you may be affected by an Event Outside Our Control (see Clause 18). In this circumstance we will not refund any payments made unless we are unable to deliver the items ordered within 120 days. 8.4 Delivery charges are not included in the price of the Products. Our delivery charges may vary dependant on your address and the weight of the parcel and will be discussed with you by a member of the Sales Team at the time of order. 8.5 Deliveries within the UK are generally made using Royal Mail Special Delivery services, and International deliveries are made using FedEx, unless otherwise requested by you. We are not liable for any delay in the delivery of the Products that is caused by an Event Outside Our Control (see Clause 18) or your failure to provide us with adequate delivery instructions. 8.6 When you are paying for the courier charges you the customer are giving Time 4 Diamonds DMCC LTD instructions to transfer all financial liability to the courier company. We do not insure Products for delivery outside of the courier companies own insurance policies. We recommend that all items are fully insured for delivery. Ensuring the Products are insured in transit is the responsibility of you, the customer. Please discuss with a member of the Sales Team. Please contact us for information on insuring your Products and we will happily give you a separate quote for insurance premium for your parcel. 8.7 Although we remain responsible for the Product until it reaches the delivery destination, our financial responsibility and liability for the product or service ends once we hand over the package to the courier and provide you with the tracking number and airway bill for your package. It is the customers responsibility to ensure that all delivery instructions, including delivery address, are correct, and that someone of trust will be present at the delivery address to receive the delivery. Any losses occurring as the result of incorrect delivery instructions, or incorrect delivery by the courier, are the responsibility of the customer and the courier company. Time4Diamonds DMCC Ltd will assist the best we can with any investigation arising from incorrect or inappropriate delivery, in coordination with the courier company in order to find the appropriate method of resolving any matters. Time4Diamonds DMCC Ltd will not be held responsible or liable for any losses including financial in the result of any failings in delivery. 8.8 We will deliver the Products to the delivery address given in the order. Any orders placed by Debit or Credit Card must be delivered to the card holder’s billing address as held with their bank, and must be signed for by an adult (aged 18 years or over). If no one is available at your address to accept delivery, the courier may leave you a calling card showing details of attempted delivery and instruction on how to arrange re-delivery at a more convenient time. Alternatively, you may need to collect the Products from the local delivery office provided you can produce adequate proof of identity. We ask that you do not sign for any parcel that has been obviously tampered with or damaged, and contact us immediately in this instance. 8.9 Products can also be collected from our office by appointment only for security reasons. You will be asked to provide evidence of identity and proof of address for all collections. Please contact a member of the Sales Team to arrange at least 24hours in advance. 8.10 Delivery will be completed once the Products are received at the billing address. By agreeing to these Terms you are accepting that Liability of the Products is transferred from Time4Diamonds DMCC Ltd to the courier as soon as they leave the Time4Diamonds premises. This means that Time4Diamonds DMCC Ltd will not be held liable if the Products are damaged or lost in transit; in this instance you will need to contact our insurers directly. Please ensure Products are insured up to their full value ( see Clause 8.6). When collected from our office, delivery is complete on handover of the Products to the customer or agreed representative. 8.11 You own the Products once we have received payment in full, including all applicable delivery charges. 9.1 We deliver to all countries covered by our chosen courier, FedEx. A list of the countries served by FedEx can be found http://www.fedex.com/gb/contact/served-countries.html. If you cannot locate your country on this list, please contact us and we will provide a fixed quotation for delivery of the product. 9.2 If you order Products from our site for delivery to one of the International Delivery Destinations, your order may be subject to import duties, taxes, fees or charges applicable to the country where the Products are being received. Please note that we have no control over these charges and we cannot predict their amount. 10.1 All pre-owned and unworn watches are supplied with manufacturer's International Warranty. If any manufacturer’s warranty is for a period less than 1 year, Time 4 Diamonds DMCC Limited will provide our own warranty, to cover 12 months warranty unless otherwise stated. 10.2 Any claims made against the Warranty, be that the manufacturers or that of Time 4 Diamonds DMCC Limited, is subject to inspection by a qualified watch maker. 10.3 If you are a consumer, a manufacturer's guarantee is in addition to, and does not affect, your legal rights in relation to Products that are faulty or not as described. Advice about your legal rights is available from Citizens' Advice Consumer Service (www.adviceguide.org.uk) or your local Trading Standards office. 11.1 All watches come with a Time 4 Diamonds DMCC Ltd 12 month warranty (the ‘Warranty’) from the date you receive the watch. This Warranty protects your watch against manufacturing and mechanical faults subject to the conditions within this Clause 11. - any alteration or repair by you or by a third party who is not one of our authorised repairers and without our consent. 11.3 If you are a consumer, this warranty is in addition to, and does not affect, your legal rights in relation to Products that are faulty or not as described. Advice about your legal rights is available from your local Citizens' Advice Bureau or Trading Standards office. 11.4 The Warranty will be registered to you, the customers, postal address. To ensure the validity of the Warranty, please make sure that you inform us of the correct address of the recipient of the watch (if someone other than the buyer of the watch), and any change of contact details including name, address, telephone number and email address. Failure to do this will invalidate the Warranty if we have the wrong contact information and a claim is made. 11.5 If you make a valid claim against Our Warranty whilst it is still covered by the manufacturer’s warranty, we reserve the right to request that you claim on the manufacturer’s warranty first. 11.6 Any watches that you have asked to be customised will automatically lose their manufacturer’s warranty as soon as customisation begins on the watch. Any warranty offered will therefore be with Time 4 Diamonds directly for a period of 12 months unless otherwise stated. 11.7 Warranty covers the mechanical parts of the watch and excludes damage by any form of water damage or misuse of the watch in any way. In the event your watch has been damaged by water, Time4Diamonds will offer to repair the watch at your expense if possible. It will also be your responsibility to deliver the watch to us in a timely manner to avoid further damage to the watch. We do not take any responsibility for the watch until such point as it is back in the Time4Diamonds office. 11.8 All watches needing a repair under Time 4 Diamonds warranty or guarantee will be void if the watch is opened or dismantled by a non-authorised Time 4 Diamonds Watchmaker. 11.9 In the event of a valid claim against your warranty, we will repair, replace or refund your watch at our sole discretion. We will attempt to give you an approximate time frame for this however this will be dependant on the nature of the work that needs to be undertaken or the timeframe needed to source replacement/part replacement. 11.10 We reserve the right to have the final decision on any claims against our Warranty. If there is a dispute we may contact an independent third party Watchmaker chosen by us to advise on the disputed issues, although we are not obliged to do so. Any reports given by the independent Watchmaker will be binding between all parties. Please note that any manufacturers recommendations which may conflict with our advice will be excluded for the purposes of our Warranty. 11.11 All service, repairs, parts and customisation to customers own watches carry a 12 month warranty, which will only apply to the parts, or work carried out. See clause 14 for more information on our servicing Terms. 11.12 When a product is under guarantee, it must be returned with the warranty card, and will be the responsibility of the sender until such point as it is within the Time4Diamonds office. Postage and packaging costs will be the responsibility of the sender, including any relevant delivery insurance. Products sent with box and papers will not be sent back with the item upon being repaired. Do not send the original box and papers for your items; we will not take responsibility for their damage or loss. 11.13 For valid Warranty claims within the UK, we will not charge for posting and packaging of returning the Product back to you after any work has been completed. If you are based outside of the UK, we will charge for postage and packaging and all other taxes, fees and applied customs charges incurred for work carried out under warranty. 12.1 Time4Diamonds are legally obliged to supply you with Products that conform to the Contract, and we aim to ensure all Products are sold with you, the customer, fully informed about the Products that you are purchasing including age, appearance, condition, any defects, manual and box authenticity and condition, relevant paperwork, and applicable warranties. 12.2 You must inspect Products as soon as possible after delivery to you, and contact us immediately to inform us if the Products are faulty or not as described upon delivery, or if you discover faults later after purchase (including Products purchased in store) up to a maximum period of 7 days. After this period all reports of faults will be inspected by us but relevant action will be discretionary dependant on the results of the inspection/testing. 12.3 You must ensure no further damage is done to the Products and return them to us within 7 days of contacting us to notify us of the fault. Products must be returned complete as of first delivery (including box, manuals, paperwork, links etc). 12.5 We will firstly attempt to repair the Products. Given the nature of the Products we sell, we are however under no obligation to repair the Products if the cost to us is deemed unreasonable in line with the value of the Products on the Contract, or if repair is not possible. 12.6 If we are not able to repair the Products due to reasons stated in 12.5, we will offer to replace the Products. We are not however obliged to replace the Products if the cost to us is unreasonable given the value of the Products at the time of Contract, or if a suitable replacement is not possible to source. 12.7 In the event we are not able to repair or replace the Products, we will offer to refund you, the customer, with your full payment. Please note that we reserve the right to make a reasonable deduction from the refund for any loss or damage to paperwork, and less any amount considered reasonable by us for wear and tear through any customer use of the product before the fault was detected. 12.8 Although we will do our best to repair any faulty Products as soon as possible, it must be noted that repair may take many months dependant on the nature of the work and whether we need to source manufacturers parts etc. If the repair is likely to exceed 3 months, we will advise you, and you will be entitled to a refund. 12.9 Return postage and insurance of the faulty items will be the customer’s responsibility, and we recommend that all packages are fully insured to the full value of the enclosed items. We will not be held responsible for any loss or damage to the items whilst in transit to us, this will be considered the responsibility of the customer. 12.10 No refunds will be given in the event of bespoke or customised Products. In the case of these Products being faulty, we will endeavour to repair/replace the Products as per 16.5 and 16.6. Due to the nature of customised Products we cannot put an estimate on how long this may take. If the period of time for either repair/replacing exceeds 3 months, the situation will be reviewed and any further decisions or actions will be made at our discretion. 13.1 If you buy a Product online from us, you have a legal right to cancel your Contract and receive a full refund based from the date on which the Contract starts (the day we receive your payment and you sign the order confirmation, whichever comes last) until 14 days after you receive your item (the relevant period). This means that during this relevant period you can change your mind about the Products without giving any reasons. This cancellation period will expire after 14 days from the Products being delivered to you or the recipient. Please note, this cancellation right does not apply to Products purchased on-site, or bespoke/customised Products. If you change your mind or decide for any other reason that you do not want to receive or keep a product, you must email a member of our Sales Team within the specified cancellation period. You must take reasonable care of the Products at all times and the Products must remain in their original condition. 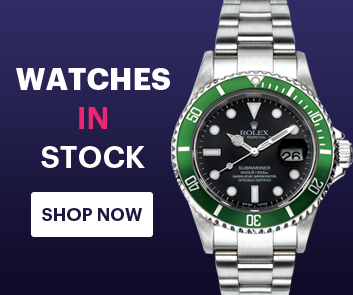 Please note, we cannot offer exchange or refunds on sale items, or Products that have been customised/personalised to your requirements (customised watches, ring resizing, engraving etc). 13.2 Once we have agreed to cancel the order/purchase (in line with 13.1) you must return any Products to us along with all paperwork, manuals, boxes, links and warranties. Postage and packaging of the Products back to us is your responsibility, and we recommend that you insure all items for their full value. We will not be responsible for any damage or loss of Products in transit back to us. All Products must be packed appropriately to prevent damage. 13.3 Returned Products will be inspected by our servicing team before any refund is made to you. Deductions will be made for any damage to the Products due to unnecessary handling, and charges will apply for any subsequent work that is necessary to return the Products to their original condition. Deductions will also be made if packaging has been opened or damaged, or if any factory seals or stickers have been removed/damaged. 13.5 Products must be returned to us no later than 7 days after we agree to a cancellation of your Contract. If you do not return the Products to us within a 7 day period, we reserve the right to void the cancellation policy. 13.6 Provided that the conditions of this Clause are met, we will refund you either in full or with the necessary deductions within 14days of receiving the Products back to us. We will refund you in the same manner that the original payment was made, unless agreed otherwise. 13.7 Any refunds related to purchases made using American Express will be subject to a 2.5% deduction fee if the item is returned. 14.1 If you would like your watch serviced, repaired, or any other work carried out (such as link removal/addition or battery replacement), our highly skilled in-house Watchmaker will be happy to assess your watch and give you a highly competitive quote on the work needed. 14.2 Our Watchmaker will assess your watch on receipt into the workshop in order to determine the level of work required. This may involve a full investigation in which opening and dismantling the watch may be necessary; by giving the watch to us you are consenting to this being done. Please note, if your watch is covered by the Manufacturer’s Warranty, we reserve the right to return the watch to you and advise that you send it to the manufacturer instead. 14.3 Once we have determined the scope of the work required, we will contact you and provide you with a verbal and written quotation for the work. We will not start any work on the watch until we have had your acceptance of the quote (and therefore these Terms and Conditions) in writing, and your permission to proceed with the work. 14.4 In the circumstance that our Watchmaker gives a quotation for work before he is able to assess the watch, or carry out a full investigation, the quotation will be an estimate only, and this may alter once a full investigation has been carried out. 14.5 Although we do our best to carefully assess your watch on receipt to determine the nature and level of work required, we reserve the right to change the amount charged to account for any unforeseeable work, additional parts or increase in the cost of parts. We will contact you to inform you of any change in the cost of the work and to gain your consent. If you choose to have the watch returned to you before the completion of any work, we reserve the right to charge you for the work already undertaken. We may return the watch to you dismantled, and it will not be covered by our servicing warranty. 14.6 We reserve the right to refuse to carry out, or agree to carry out, any work on your watch for any reason, for example if we feel that the work requested will be detrimental to the watch in any way. In this circumstance we will contact you after our assessment of the watch and inform you. 14.7 We will give you an estimated time frame for completion of the work requested/needed on your watch at the time of quotation. Please note it is not always possible for us to provide you with a timeframe, and any timeframe given is an estimate only and may change at any time. On acceptance of the quotation you are acknowledging that the timeframe for work completed may extend to several months, especially true of occasions when replacement parts need to be ordered from the manufacturer. We will endeavour to keep you informed of any extension of timeframe. 14.8 Please inform us if you need the work completed in a specific timeframe, or for a particular date. Although we will always endeavour to get the work completed as soon as reasonably possible, this may affect our acceptance of the watch if we feel that we will not realistically be able to meet the deadline of completion. 14.9 The price you pay depends on the work that we carry out on your watch. We give our quotes in good faith, however we reserve the right at any time to change the cost of work required should we need to ( see 14.5). All quotes are excluding delivery charges. 14.10 To get an assessment and quotation for your watch, or to proceed with work already quoted, please deliver your watch to our Time4Diamonds offices at the address stated in Clause 1. Postage, packaging and insurance will be your responsibility and at your own cost. We advise that all packages are insured up to the full value of the goods inside; any loss or damage to the goods in transit will be your responsibility. Please ensure that your watch is packed appropriately to avoid damage during transit. You can also deliver, and collect, your watch in person from our offices with prior appointment. Please contact our Sales Team to arrange a convenient time. 14.11 Return postage and packaging of your watch after work has been completed is not included in the quotation for work, and will be at your own cost. Please ask for delivery charges at time of obtaining a quote from us. Please see Clause 8; Delivery (8.3-8.10), and Clause 9 International Delivery. 14.12 If you are based within the UK, and the work carried out is a valid claim against our Time4Diamonds warranty on a watch you purchased from us, we will not charge for the posting and packaging costs of returning the watch to you after any work has been completed. We will charge for postage, packaging, insurance and all other taxes, fees and charges applied by customs incurred for work carried out under warranty if you are based outside of the UK. 14.14 We reserve the right to have the final decision on any claims against our Servicing Warranty. If there is a dispute we may contact an independent third party Watchmaker chosen by us to advise on the disputed issues, although we are not obliged to do so. Any reports given by the independent Watchmaker will be binding between all parties. Please note that any manufacturer’s recommendations which may conflict with our advice will be excluded for the purposes of our Warranty. 15.1 We amend these Terms from time to time. Every time you order Products from us, the Terms in force at the time of your order will apply to the Contract between you and us. changes in relevant laws and regulatory requirements; and changes to our internal policy. 15.3 If we have to revise these Terms as they apply to your order, we will contact you to give you reasonable advance notice of the changes and let you know how to cancel the Contract if you are not happy with the changes. You may cancel either in respect of all the affected Products or just the Products you have yet to receive. 15.4 If you opt to cancel, you will have to return (at customer cost) any relevant Products you have already received and we will arrange a full refund of the price you have paid excluding delivery charges. 15.5 We reserve the right to cancel an order at any time before the Products are delivered to you, for reasons including unavailability of stock or Events Outside Of Our Control. In the event of this we will contact you as soon as possible and subsequently refund any payments that have been made by you thus far. 16.1 If we reasonably suspect a fraudulent payment regarding any form of payment, then we will not dispatch any Goods and we will not carry out any refunds until authorised by our bank. - Or defective Products under the Consumer Protection Act 1987. 17.3 Subject to Clause 17.1, our total liability to you in respect of all losses arising under or in connection with the Contract, whether in Contract, tort (including negligence), breach of statutory duty, or otherwise, shall in no circumstances exceed 100% of the price of the Products. 18.1 We only supply the Products for domestic and private use. You agree not to use the product for any commercial, business or resale purposes, and we have no liability to you for any loss of profit, loss of business, business interruption, or loss of business opportunity. 18.3 In the event of any financial or legal claim against Time 4 Diamonds DMCC LTD all claims must be sent to our insurers TH March for them to investigate and start any claim process. Time 4 Diamonds DMCC LTD or the Directors, shareholders and employees will under NO circumstance be held personally responsible or liable for any financial loss to the customer. we will contact you as soon as reasonably possible to notify you, and our obligations under a Contract will be suspended and the time for performance of our obligations will be extended for the duration of the Event Outside Our Control. 19.4 Where the Event Outside Our Control affects our delivery of Products to you, we will arrange a new delivery date with you after the Event Outside Our Control is over. 19.5 You may cancel a Contract affected by an Event Outside Our Control which has continued for more than 120 days. To cancel please contact us. If you opt to cancel, you will have to return (at our cost) any relevant Products you have already received and we will refund the price you have paid, including any delivery charges. 20.2 If you are a consumer, you may only purchase Products from our site if you are at least 18 years old. 20.3 If you are not a consumer, you confirm that you have authority to bind any business on whose behalf you use our site to purchase Products. - If you are a consumer you may contact us as described in Clause 1.1. - Any notice or other communication given by you to us, or by us to you, under or in connection with the Contract shall be in writing and shall be delivered personally, sent by prepaid first class post or other next working day delivery service or e-mail. - A notice or other communication shall be deemed to have been received: if delivered personally, when left at our registered office; if sent by prepaid first class post or other next working day delivery service, at 9.00 am on the second Business Day after posting or if sent by e-mail, one Business Day after transmission. - In proving the service of any notice, it will be sufficient to prove, in the case of a letter, that such letter was properly addressed, stamped and placed in the post and, in the case of an e-mail, that such email was sent to the specified e-mail address of the addressee. 21.2 This Contract is between you and us. No other person shall have any rights to enforce any of its terms, whether under the Contracts (Rights of Third Parties) Act 1999 or otherwise. However, if you are a consumer, the recipient of your gift of a Product will have the benefit of our warranties (Clause 11), however neither us nor you will need their consent to cancel or make any changes to these Terms. 21.3 Each of the paragraphs of these Terms operates separately. If any court or relevant authority decides that any of them are invalid, unlawful or unenforceable, that paragraph or term will be severed, with the remaining paragraphs continuing in full force and effect. 21.7 If you are a business, we both irrevocably agree that the courts of England and Wales shall have exclusive jurisdiction to settle any dispute or claim arising out of or in connection with a Contract or its subject matter or formation (including non-Contractual disputes or claims, proceedings or other documents in any legal action).